Today is one the most important day of "Nowruz"
Dating back to ancient times, Nowruz has always been celebrated as the beginning of the new year by people all around the world. It marks the first day of spring and the beginning of the year. It is celebrated on the day of the astronomical Northward equinox, which usually occurs on March 21 or the previous/following day depending on where it is observed. The moment the Sun crosses the celestial equator and equalizes night and day is calculated exactly every year and families gather together to observe the rituals. Usually preparation for Nowruz begins a month prior to the festival. Each of forthcoming 4 weeks is devoted to one of the four elements and called accordingly in Azerbaijan. Each Tueasday people celebrate the day of one of the four elements- water, fire, earth and wind. The last and the most important Tuesday is devoted to wind and called Yel Charshanbasi or Ilakhir Chershenbe by Azerbaijani people. 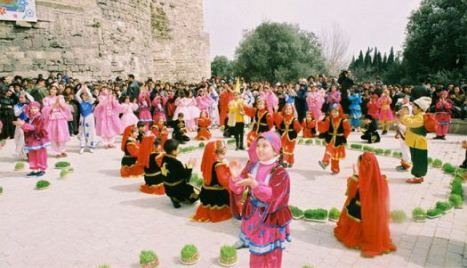 Nowruz is celebrated and observed by Azerbaijani people and the related cultural continent and has spread in many other parts of the world, including parts of Central Asia, Caucasus, South Asia, Northwestern China, the Crimea and some groups in the Balkans.